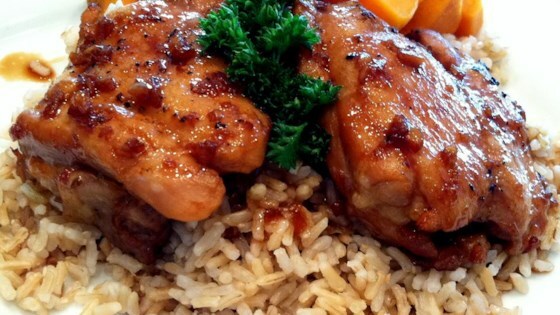 "This is a very tasty and easy-to-make Filipino chicken dish made with soy sauce, garlic, and vinegar. I can just as easily double or triple the chicken in this recipe to serve guests at a party. Serve over rice with just a little of the sauce (not too much)." In a large pot, mix soy sauce, water, vinegar, honey, garlic, bay leaves, and pepper. Bring the mixture to a boil, and place the chicken into the pot. Reduce heat, cover, and cook 35 to 40 minutes. Remove chicken, drain on paper towels, and set aside. Discard bay leaves. Return the mixture to a boil, and cook until reduced to about 1 1/2 cups. Place chicken on the prepared grill, about 5 minutes on each side, until browned and crisp. Serve with the remaining soy sauce mixture. See a quick-and-easy recipe for fabulous, five-spice grilled chicken. Decreased soy sauce to 1 cup, increased water to 2 cups, and used rice vinegar. Very unique but even the picky 11-yr old son ejoys this dish.